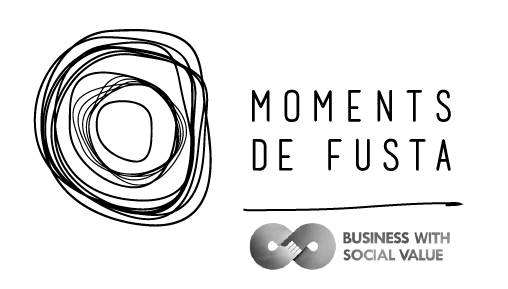 MOMENTS DE FUSTA is a social business initiative that creates, builds and sells products made from repurposed wood, such as pallets, wine boxes and other odd pieces and scraps, with the utmost respect for forest sustainability. We create and produce decorative everyday items using a simple imaginative industrial design and sophisticated illustrations. Our suppliers and collaborators are organizations working with groups at risk of social exclusion: youths in social and work placement programs and people with disabilities. Joan Riera has a background in the stage, having worked at the Poliorama Theater with several international directors before eventually forming his own company (Inventari Teatral), which specializes in social theater and contemporary dramaturgy. He later spent several years as a cultural and events manager (Hestium Disseny and production): Festes Mercè Barcelona, Fira de Música Tradicional de Manresa, Museu del Ferro Rosell, Museu del Tabac Reig, Museu del Perfum Júlia, Alimentària, Graphispag, Fira Gran, Seat, Salvat, Argentaria, Puig Perfumes, Media Pro Sport... Most recently, he worked in the field of international development, designing and implementing sociocultural projects in countries in America, Africa and Asia.